Time for another Daring Bakers' challenge. 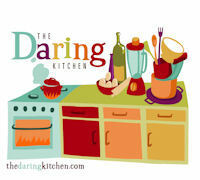 This month's challenge was hosted by Aparna of My Diverse Kitchen and Deeba of Passionate About Baking. They came up with an amalgamation of recipes for a tiramisu. Their challenge recipe is based on recipes from The Washington Post (newspaper), Cordon Bleu at Home (cookbook) and Baking Obsession (blog). 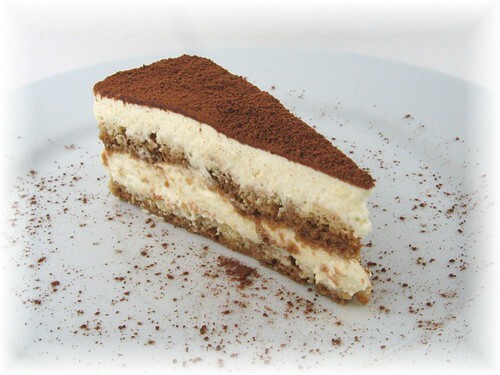 Tiramisu is typically custardy mascarpone cream layered with ladyfingers/savoiardi biscuits soaked in espresso. A little bit of booze like marsala or rum is usually present too. We were required to make the mascarpone cheese and ladyfingers from scratch. We were also required to make the zabaglione and pastry cream for the custardy cream layers. I've never thought about making mascarpone from scratch since I can buy an 8 ounce tub for about $3 around here. The recipe looked fairly straightforward. Who knew it was just heated heavy cream and lemon juice? I used a really nice 36% butterfat organic cream. Unfortunately, even though I heated the cream for 30 minutes in a stainless steel bowl in a skillet of simmering water, my cream never got any hotter than 170F. The instructions said it would get to 190F in about 15 minutes. So I forged ahead anyway and added the lemon juice and waited for the curds to form. That never happened either. So after another 10 minutes I just poured my "cheese" into my cheesecloth lined strainer. After the overnight refrigeration I expected that some whey would have drained out. Nope, my "cheese" looked no different than it had when I first pour it into the cheesecloth and it looked nothing like creamy mascarpone. Then I tried to remove my mascarpone from the cheesecloth. It was stuck on pretty tightly. So tight that when I forcefully scraped it off the cloth, all I got was a block of "cheese" covered in lint. I thought cheesecloth was supposed to be lint free? Maybe I got the wrong kind of cheesecloth? (I used a 100% unbleached cotton cheesecloth.) So I scraped off the linty side of the mascarpone and saved the unlinty part to use in my tiramisu. Thank goodness we only needed 1/3 cup for the tiramisu. I love ladyfingers. When I was a little girl, sometimes my dad would take me with him while he went to Ahren's Bakery on Van Ness Avenue to pick up some pastries for the restaurant. The bakery workers were always so nice to me. While I waited for them to fill my dad's very large order, they always handed me a giant cookie from the bakery case. I felt so special. But the best part of our trips to Ahren's was the bag of soft ladyfingers that we would bring home. Sets of five ladyfingers were lined up next to each other waiting to be pulled apart. I can still recall that soft, airy interior with that wonderful crispy, sugary crust. I wonder if Ahren's was still around today and I ate one of their ladyfingers would I still love it as much as I did as a child? I'd love to say yes, but the truth is probably not. The most flavorful ingredient is nostalgia. I loved this ladyfinger recipe. They remind me of those from my childhood. I couldn't help but sneak a few bites everyday. Well, maybe I had more than a few bites. By the time I was ready to assemble my tiramisu three days later, I only had enough ladyfingers for two layers instead of three. 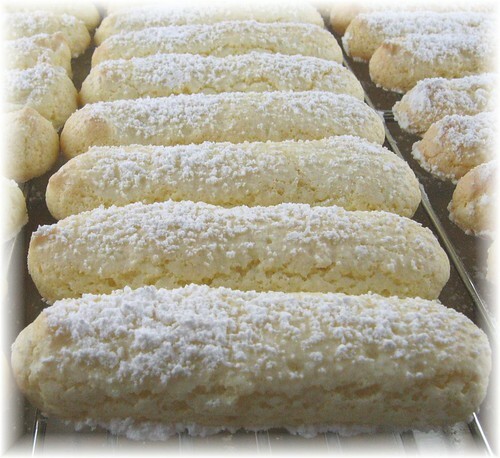 I plan to make these ladyfingers again and again. In the past I've only made tiramisu recipes that had a zabaglione with mascarpone. But this recipe had the unusual addition of a pastry cream. It was also a bit strange that it only called for a teeny tiny amount of mascarpone cheese. Typically mascarpone makes up a large portion of the cream layers. The zabaglione was easy to make. The method for the pastry cream was a bit different than I am used to since the cold milk was combined with the egg then cooked. I am used to warming the milk, adding it to the eggs and then cooking it until thick. I think the cold milk method took longer to thicken than the warm milk method, but the resulting pastry cream was just fine. We were allowed to assemble our tiramisu any way we liked. I decided to use an 8-inch round springform. If I knew ahead of time that I was going to use a round cake pan for assembly, I would have piped my ladyfinger batter into 8 -inch disks instead of individual fingers. It would've made for a nicer presentation. Overall the tiramisu was delicious. But what's not to like about whipped cream, custard and coffee soaked ladyfingers? Even though I found the whole recipe to be a bit overly complicated and fussy for a tiramisu and I would probably never make this exact version of tiramisu ever again, I'm so happy that I have gotten such a great ladyfinger recipe out of this DB challenge. Okay, I'm off to have another slice now. 1. If you cannot find Marsala, port wine is considered a good substitute. 2. If you would rather not use alcohol in your tiramisu due to diet restrictions or because you want to serve it to children, you may replace the Marsala with an equal amount of espresso or coffee. 3. Many people, especially those who are not excessively fond of coffee, might find brewed espresso very strong. In this case, please feel free to dilute the espresso or coffee to the desired strength. 4. It is generally suggested that cream with 25% fat is best for making mascarpone, but 36% works just as well. 5. We both used lime juice. Deeba has a recipe for mascarpone posted on her blog here. 7. While using the double boiler to make the mascarpone as well as the zabaglione, always ensure that the bottom of the bowl on top doesn't touch the bottom of the lower one. 8. Ladyfinger batter is very fragile so fold in the flour and yolks very carefully into the meringue so that the whites don't lose their volume. 9. It might be a good idea to decide the size of the dish in which you intend to set the dessert, and make the fingers to a size which would fit that dish. This makes it easier when assembling the tiramisu later. Do remember that ladyfingers/ savioardi puff up a little while baking. 10. 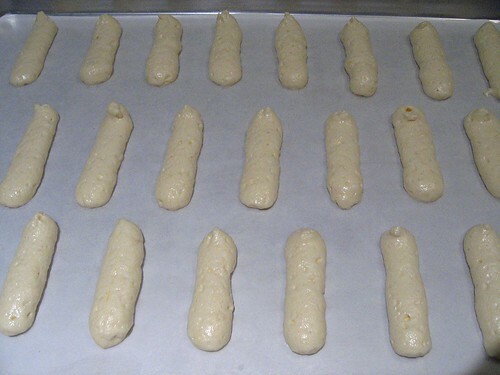 Ladyfinger biscuits may be stored up to a week in an airtight container. We both made the savoiardi fingers 4-5 days in advance, and stored them in an airtight box in a cool place (or the refrigerator). 11. We both made the zabaglione & pastry cream the previous day, and assembled the tiramisu the next morning. I (Aparna) then froze my tiramisu for 7 days before decorating and serving it. 12. Placing the bowl (in which cream is to be whipped) and the beaters of the hand held electric mixer in the fridge for about 1/2 to 1 hour before hand makes the cream whip up very well. 13. Do not dip the ladyfinger/ savoiardi into the coffee solution for more than ONE second, or they might become very fragile & disintegrate. Extra soaking is likely to spoil the end product, making it soggy. I (Aparna) dipped my biscuits only on one side and found they soaked up more than enough coffee solution. 14. If you would like to de-mould your tiramisu from your dish (cutting can be easier and neater this way, you can line your dish with plastic wrap (leaving a little extra on the sides of the dish) and then start assembling your tiramisu. Once the tiramisu sets in the refrigerator, you can use the overhang to pull the tiramisu out of the dish. Tiramisu is usually made in square dishes and cut into squares to serve. If you want to be different, please feel free to give full rein to your creativity as to how you want to present, decorate and serve your tiramisu. Make it square, round, as individual servings, or whatever! However, your version of Tiramisu must contain the mascarpone cheese and the savoiardi/ ladyfinger biscuits you made. Keep mascarpone refrigerated and use within 3 to 4 days. 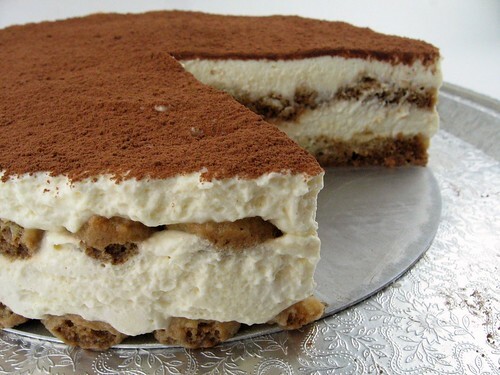 A very neat slice of Tiramisu! Thanks for recipe...i 'll try.. Very well done! Thiose ladyfingers are perfect and the Tiramisu is beautiful! This looks yummy! Good job! My marscapone turned out very very thick too, and I did find the over all recipe odd in having to make so many components in such small quantities, but I did enjoy the end result. Yours looks fabulous and delcious! A beautiful well-shaped Tiramisu; great job! I also had trouble with the mascarpone, but it's very expensive here in NY so I think I'll try again. 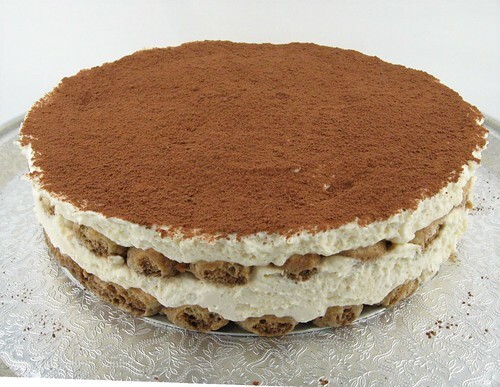 Yummy, your sliced tiramisu looks so pretty with all those layers!I loved the ladyfingers too! WOW! Mary, what perfects layers! ...and I have to admit, you are a master at cuts! Bravo... this is very, very well done! I couldnt get my cream to heat up either but I got the cheese alright! Your tiramisu looks just splendid. I love how luscious it looks and how its just begging to be eaten. Great job as always! Looks delish. Am not sure what went wrong with the mascarpone, though. Happy that the ladyfingers are like what you rememeber. That looks amazing! When I made tiramisu at a coffee shop I worked at, I would take any leftover cream, put it in a cup, garnish it with a few chocolate curls, and sell it with the leftover ladyfingers. I called it tiramisu dippers. They sold out faster than the tiramisu did! Gorgeous job on your tiramisu. I love your beautiful photographs. They are so very elegant. You know, I had the same problem with the marscapone. It didn't get above 170 degrees. But I forged ahead as well and it ended up turning out ok. I like your idea of shaping it in a springform pan...it looks wonderful! mary i am loving your gorgeous cake like dessert. perfect looking slice! Yum! I agree that it sounds like a "fussy" recipe for Tiramisu...but happy you found a new favorite ladyfinger recipe! And, I loved the part where you said "the most flavorful ingredient is nostalgia"! It is often SO true! This was one of those 'can't see the forest for the trees' recipes. The actual process was tedious but it all came together easily enough at the end. Looks perfect! Exactly like the ones at my favourite italian places! :) I like how it's round, like a cake, since it's mostly layered in a glass dish. This just looks more...dessert-y. Sounds like quite an adventure trying to make the mascarpone. Your tiramisu turned out beautifully! Mhhhmmm...i just can't resist Tiramisu. I tried it this summer for th efirst time, and it was so sweet, cause of all that sugar in it, but reminds me cause of its meltines, of ice cream. But when i tried for the second time, in some other restaurant, it has much, much better taste, so melty and light.